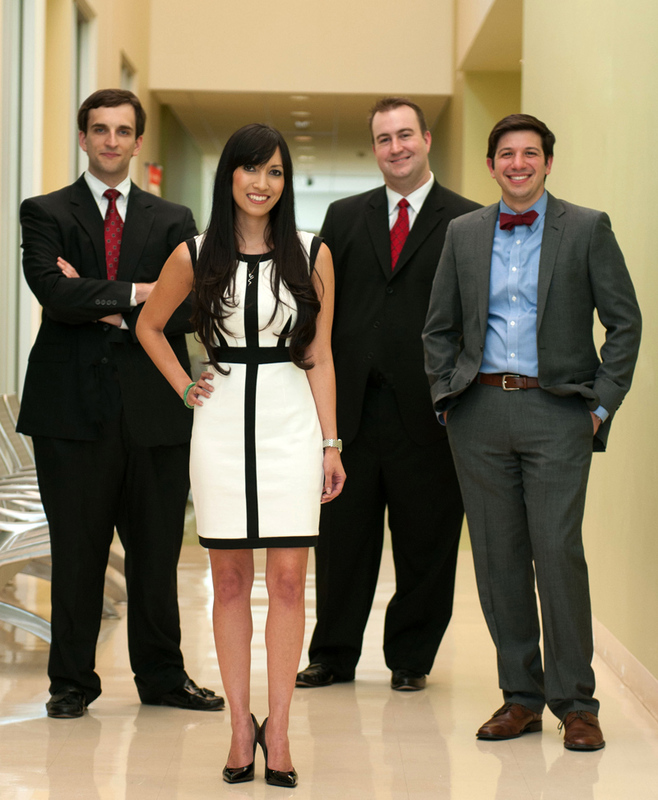 A team of four Bauer MBA students, including (left to right) James McLellan, Heather Nguyen, Jason Ruth and Adam Jalfon, are the Americas champions for the 2013 Google Online Marketing Challenge for their campaign for the Children’s Museum of Houston. Google announced recently that a team of four MBA students from the C. T. Bauer College of Business at the University of Houston are the Americas champions of the 2013 Google Online Marketing Challenge. The team, comprised of Bauer MBA students Heather Nguyen, Jason Ruth, Adam Jalfon and James McLellan, competed against 12,000 students from more than 80 countries to become the Americas Winner in the challenge, which allows college students to display their skills in advertising, ecommerce, integrated communication, management information systems, marketing and new media technologies. Bauer teams have competed in the challenge for the past four years, with the 2011 team taking the global title. Preparation for the competition began months before the team submitted its final report. To begin the process, the Bauer students selected a client — the Children’s Museum of Houston — and analyzed the company’s business and marketing needs. Then, the team drafted a pre-campaign report, according to a rubric provided by Google. After submitting the report online, the team was given an online Google AdWords account and $250 from Google for a three-week campaign to improve online marketing efforts for the museum. “Forester Research forecasts that spending for U.S. online marketing will be $50 billion this year. Being able to design, create and execute an online marketing campaign for $250 that cuts through that noise and is judged by Google, industry professionals and academic experts to be the most effective in all of North, South and Central America is a herculean accomplishment. And, being recognized twice in the past three years as either the best in the Americas or the best in the world for online marketing is reflective of the quality of UH Bauer College marketing students,” said Executive Professor Steven Koch, the team’s faculty advisor. The students came together in a course taught by Koch. In order to be accepted into the class, students were interviewed and required to complete a course in Internet Marketing and Ecommerce. Her teammate Jason Ruth agreed. The team’s campaign, while running, was constantly evaluated, in real time, by Google using 30 performance algorithms, grouped into five constructs — account structure, optimization techniques, account activity and reporting, and budget and performance. The team’s pre and post written reports were evaluated by a panel of industry experts, Google executives and academicians using a preset rubric. This is the fourth year for a Bauer MBA team to enter the competition. In 2011, four Bauer MBAs were named global champions with their plan for the Houston Symphony. A team of four Bauer MBA students, including James McLellan, Heather Nguyen, Jason Ruth and Adam Jalfon, are the Americas champions for the 2013 Google Online Marketing Challenge for their campaign for the Children’s Museum of Houston. Congratulations, guys! That’s an awesome accomplishment. It truly demonstrates the value of the Bauer MBA program. Great job by the team and the faculty at Bauer. Very impressive! Speaks volumes to the marketing program at Bauer. Congratulations UH! Congratulations!! So proud to see my classmates excel and bring Bauer well deserved accolades. What an Honor! I’m Very proud of Heather and her colleagues! Nice work Heather,James,Jason and Adam. Way to go Coogs on being recognized another year!! This outstanding achievement demonstrates, once again, how phenomenal the Bauer MBA program truly is. Congrats again to Heather, Jason, Adam, and James!! This is a great accomplishment! for the team and for the college. Congratulations! Really excellent job, guys. Reflects well on the caliber of the students and faculty at UH. Adam….U Da Man! Congrats brother!! Way to go Adam!!! Way to go Jason!